Home / Client Authored / Run Faster. Jump Higher. Recover Better. 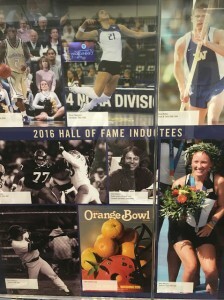 Class of 2016: University of Washington Sports Hall of Fame. Do you think these athletes benefited from chiropractic care? Chances are, if they had access and knowledge about the power of chiropractic, Yes! As the Fall sports season kicks into full stride, the desire to do everything we can to maximize recovery time and increase performance is greater than ever. If you’re already training hard, eating well and keeping well-hydrated, that’s great. And you may be overlooking the most important aspect of health that is vital to achieving your goals this season. Having an optimally functioning nervous system is crucial to gaining the competitive edge whether you’re out to win the next match or playing a game of one on one with your child. The most cutting edge neuroscience and research on the brain is finding that stimulation and nutrition to your brain requires a healthy spine. In Brain Research, Yates describes the importance of proper nervous system function on balance, posture and breathing. Yates writes, “In addition to maintaining stable eye and body position during movement, the vestibular system influences cardiovascular and respiratory control; vestibulosympathetic and vestibulorespiratory reflexes may be important in correcting posturally related disturbances”. In other words, proper posture and nervous system function are directly related to balance, eye movements and control over your breathing pathways. What athlete wouldn’t want better hand-eye coordination, balance, and ability to take in oxygen during the high demands of sport? Having a properly functioning nervous system is sure to give you the extra edge on your competition. How would being able to run faster and jump higher give you a competitive advantage? In 2000, Colloca and Keller published a study in JMPT designed to see how a single chiropractic adjustment could impact the strength of muscles. They found that after a single adjustment, athletes had stronger muscle contractions measured by EMG technology. By maintaining a healthy nervous system through chiropractic care as part of a healthy lifestyle your muscles will be bigger, faster and stronger. One key factor in becoming bigger, stronger and faster is the body’s ability to recover and heal. New research supports that chiropractic adjustments help reduce harmful inflammatory substances without reducing Substance P, a chemical responsible for cell growth and repair. This study is the first of its kind to support that chiropractic adjustments can help reduce harmful inflammation after grueling workouts while simultaneously boosting the immune system to help the body heal quickly.